I have long been an admirer of the sensitive work by Sarah Amy Fishlock, and her latest series is no exception. Beloved Curve is an intensely personal piece, revolving around the death of her father, Michael, more than 10 years ago, when she was 18. Here, Sarah speaks about the pictures. My father's absence has often felt like a protracted one-sided conversation. As I try to piece together a picture of his life, there is a frustrating longing for a story that can now only be told second hand, and in fragments. Absence renders places important and symbolic, holding imagined vestiges of the lost person. I am fascinated by the journeys my father made as a merchant seaman in the 1970s, to South Africa, the Far East and the USA: they remain wrapped in mystery, our communication cut off by his death. In the absence of his physical presence, I decided to explore the trajectory of my father's life, as a complete, finished narrative that I could access in moments, through family photographs and my own memories. I revisited many of the places depicted in the family album - the Italian Riviera, from where my mother's family came to Scotland; Edinburgh, where my father was studying for a nautical qualification when he met my mother; and York, the place of his birth. 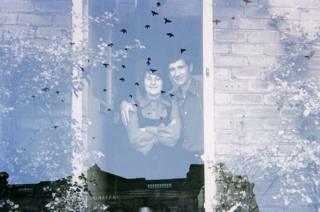 An image of my parents as a young couple in Sunderland merges with a flock of birds flying over York Art Gallery, a place he proudly showed my mother in the early days of their relationship. My father on board a cruise ship, somewhere in the Atlantic Ocean between Southampton and Cape Town, is layered with crashing waves at Riomaggiore, in north-west Italy. These strange composites echo the complicated, hidden workings of human memory, in which moments many decades apart sit side by side, or one on top of the other, oblivious to the passing of time. Using double-exposure techniques to create a dialogue between my father's documented - photographed - past and my immediate, unknowable present, the work attempts to reconcile the two realities that grief creates: one in which the beloved is a living, breathing person, and the other, in which they exist only in the memory of the bereaved, resigning agency to the imagination of the living. The work represents an attempt to counteract the passive helplessness of grief - to preserve something of my father's memory as the years pass, to keep him a part of my consciousness even though he is not present, to preserve his personhood and prevent him from becoming one of the numberless, anonymous dead. I made the first set of images on 35mm film by photographing the original prints, then reloaded and reshot the film. I let myself be guided by intuition when making the second set of images - I tried not to think too much about each combination. I found myself increasingly drawn to natural forms as the project progressed. Something about the silent persistence of nature seemed to complement my intentions in making the work, which simultaneously portrays my father's life and my present without him, as well as the process of mourning that has encroached and retreated in equal measure in the 12 years since his death. With the passing of time, and against the eternal regenerative drive of nature, loss can seem almost bearable. But when we each think of our own personal grief, perspective becomes meaningless and our devastation is renewed - the lost moments, days and years suddenly painfully apparent. Both memorial and celebration, the work reflects this undulating, cyclical element of mourning - remembering and forgetting, invoking and suppressing. In some images, my father's presence is clear, his features perfectly recollected. In others, he is indistinct, as my memory of his physicality is eroded by time, his reality slowly reclaimed by the natural world, receding into the past as my own trajectory continues into the future. Beloved Curve by Sarah Amy Fishlock is part of Peripheral Histories exhibition at two locations in Glasgow, The Lighthouse and Platform, along with the work of three other Scotland-based artists, Alan Knox, Kotryna Ula Kiliulyte and Calum Douglas, until 2 October. The project was supported by Glasgow Life Visual Art and Craft Award and Street Level Photoworks gallery in Glasgow. You can see a previous piece I ran on Sarah's Middlemen series here and see more of her work on her website.